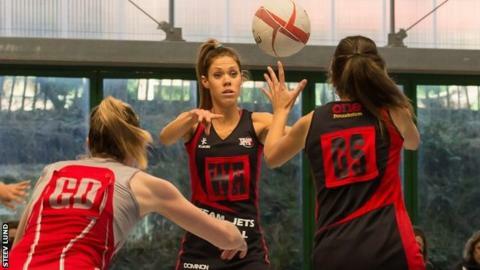 Jersey's Team Jets ended their first Premier Three campaign in third place after a 45-41 victory over Linden. Linda Andrews' were 10-goals down during the first half, but turned it around to seal the victory. Ryland won the division, and automatic promotion to Premier Two, after beating Norfolk United 47-36, with Kent County second above Jets on goal average. Jets and Kent will face Premier Two sides Leyton and Dominoes in the play-offs on 9 May at Loughborough. "I'm so proud of us, we really dug deep and by the end it was such a solid team performance," captain Lauren Devine told BBC Radio Jersey. "They were a Premier Two team last year so we knew they were going to be tough, they've got a quality coach and quality players, so I'm so proud to come out with that win after being 10 goals down."